13. 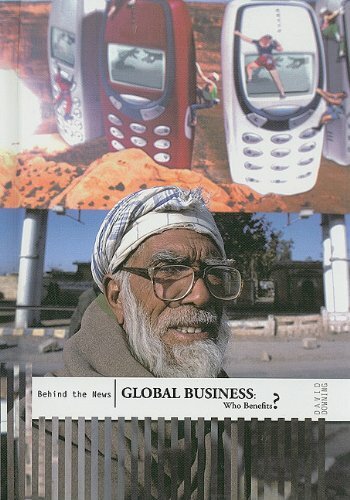 Global Business: Who Benefits? I've read a few excerpts of this book, & I was all set to buy it. Since it was pretty much self-published, it was hard to find. Then the author passed away -- with it, we've also lost the only proper compendium & history of words that have been added to the English lexicon by hard-pressed news stringers saving money by their creativity in compressing the language to take advantage of the "per word" costs of telegraphy. For starters, these frugalities handed us POTUS & SCOTUS. In the deaf community that uses TDDs to communicate by phone, we still have artifacts like SKSK ("stop keying," for "I'm done, bye.") & GA ("go ahead," for "your turn to speak"). I still use "tnx" for "thanks," & "gpm" for "good evening." This tendency led directly to BBS abbreviations like IMHO, Internet "l33t" words, emoticons, & so on. 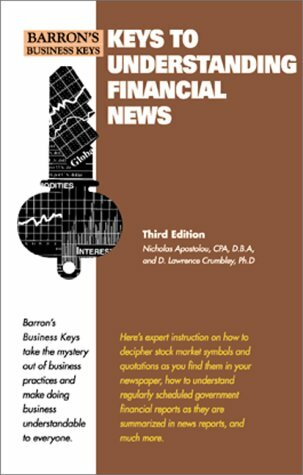 The role of the business press in the current financial crisis strikes at the heart of the heated debate about the media’s role as guardians of our democratic society.With contributions from leading journalists and academics at the forefront of this issue, Bad News is the first attempt to navigate through a controversy that will be studied for decades to come. At a time when the world has been blindsided by failures of intelligence, a veteran CBS News correspondent reveals how the news media has betrayed our trust and endangered our democracy. Tom Fenton is the senior European correspondent for CBS News. In his long journalistic experience, he has reported on everything from the fall of the Shah of Iran to the crumbling of communism in East Germany to the bombing of Israel during the first Gulf War. Today he has covered the movements of al Qaeda throughout Europe–a story he was tracking before 9/11. And in the three years since, he has come to a sobering realization: the American news media–and network TV news in particular–has abdicated its responsibility to the American people. As Fenton points out, much of America still gets its news from the networks. But in the years leading to 9/11 the coverage of terrorism was sporadic at best, focusing on acts of terror rather than the people and movements that caused them. It was Washington's job to connect the dots, Fenton argues, but it was the news business's job to track the story and watchdog the government's vigilance–and both sides failed. "By the time of the Bush–Kerry election," Fenton writes, "for the first time, the news media had an even worse credibility gap" than the government's. Lulled into complacency by the Cold War, gutted by corporate bottom–lining bottom feeders, the news media missed the story of the century–just as they'd missed hundreds of others in the years before, from Kosovo to Chechnya. As a frequent voice in the wilderness himself–who tried unsuccessfully to interest CBS in an Osama bin Laden interview in the 1990s–Fenton charges that the news media must change its perspective from that of an entertainment–industry offshoot to that of a keeper of the public trust. And he argues that his industry must foster a new patriotic skepticism, one that will both inform the people and help Washington defend the country better. Tom Fenton's passionate argument for change in the political sector is being embraced by readers on all sides. 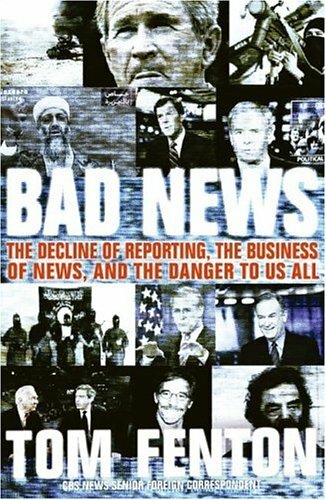 Since its publication in the United States Bad News has won wide and critical acclaim from such publications as Publisher's Weekly, Washington Post, and Christian Science Monitor. I read Bernard Goldberg's "Arrogance" alongside Eric Alterman's "What Liberal Media?" two years ago. 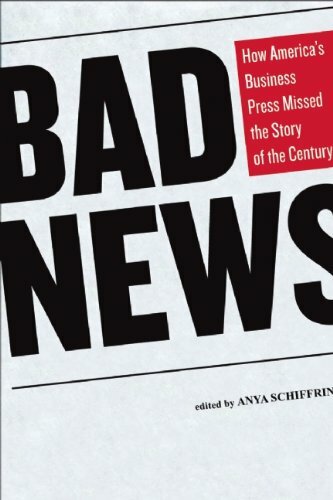 Fenton's "Bad News" is a much more balanced look on media bias, with better research to boot. Fenton's long book title is misleading. His main issue is the lack of US foreign policy coverage on US broadcast television. He ignores issues with domestic and local news. He briefly deals with print journalism. And just casually mentions journalistic blogging. He wants his old job to reclaim the importance and respectability it had during the Cold War. He credits the Cold War days as the reason foreign news correspondents were revered and coverage was at its professional heights. After the Cold War, America lost its fear and vigilance, and the broadcast networks degenerated into profit-seeking infotainment. He also claims that the fall of broadcast news is intimately linked to the earlier fall of foreign news coverage. Fenton wants a national consensus among the public on the importance of foreign news. And he wants journalists to not just present the news, but to push it; doing less is to shirk journalistic responsibility. He ties his arguments for increasing foreign news coverage as bettering the national security of American soil and the international security of American citizens. These points of his are slightly disturbing even though I believe and agree with him. He crafts a tight argument, anticipates logical reactions, and pulls no punches. But what he implies goes against conventional thinking. I'm sure the last thing Fenton wants is for American broadcast news to be an ideological machine. But if you want to do adequate foreign reporting for the sake of American interests, you have to judge news by its usefulness to the American public and American safety before all. And that'll automatically require a degree of patriotic and national bias when broadcasters do their agenda-setting. The other thing that stands out in Fenton's book is the issue of media bias, which I've encountered in Goldberg's and Alterman's books. In Chapter 4, "The Culture of Spin", Fenton confronts the biases in journalism at all levels. He notes that a majority of it is partisan politics and corporate interests, but other factors are more personal, like a journalist's desires to cling to socioeconomic or "ethnic solidarity". I think the only questionable thing that Fenton claims in this section is to complain that liberalism, as a philosophy (and not a party or a political entity), has taken the gumption out of news coverage. Overall, the most useful thing about Fenton's book is that it gave me a strategic historical overview of all the countries relevant to the foreign news still occurring today. And the little insights peppered throughout the book are eye-openers in other ways. Page 171 is particularly singed to my brain, where a mention of "the oddly straight-line borders of Iraq" highlights the fact that the country didn't develop organically, but is "an essentially artificial space." Just by giving me a handy historical rundown, Fenton's lessened my apathy towards foreign news. But despite Fenton's hopes, I feel that the causes of audiences' apathy towards news reporting are bigger and beyond the problems Fenton claims are plaguing journalism. Reviving foreign news coverage might be a step towards the cure, but the apathy runs deep and is intertwined with too many other factors. ULTIMATELY, his huge nostalgia for the Cold War leads to a radical conclusion: what he's essentially calling for, but doesn't say outright, is to elevate US foreign reporting to the level of military intelligence gathering. To the publisher: WHY ARE THERE SO MANY TYPOS AND STRAY WORDS IN THE TEXT? GET A BETTER PROOFREADER! Bad News, Bad, Bad News! Tom Fenton has a bone to pick. As a veteran foreign correspondent for CBS News, he watched as his industry gave up investigative antagonistic independent journalism for "puff pieces," Barbara Walters/Geraldo Rivera-style entertainment, and rebroadcasting corporate and/or government packaged reports masquerading as "news. "He's completely right that for at least 20 years the evening news has been a sham. Economics is part of it, as Fenton describes how a couple tenths of a percentage point in the ratings means millions in advertising revenue.By pandering to the lowest common denominator, the major networks have guaranteed that the LCD is the only demographic served. Also part of it, as Fenton takes great pains to point out, is the coziness of news bureaus with the current administration, which freezes out journalists who do not toe the party line.When lying to the public has become such an art, exposing the man behind the curtain is a sure trip to the Nowhere Idaho beat, or an IRS audit, or both. Fenton has stern words for the current Bush Administration, as well as the Clinton and Bush Sr. Administrations before it.He seems rather soft on the Reagan Administration, even though this was when the run-up to Wall Street tyranny began. The first third of the book is a little annoying, as Fenton takes every opportunity to place himself on a short list consisting of "Cronkite, Brokaw, Rather & Fenton. "Frankly, I don't think he belongs on that list. Nevertheless, having established his credentials the second third of the book details the failings of the TV news industry, how foreign bureaus were trimmed or eliminated completely after the fall of the USSR, and how American news turned inward and downward -- to our great detriment.In large part the developments in the world-at-large went unreported for two decades so the events of 1998-2001 caught many of us by surprise. The last third of the book explains why this situation is so dangerous.In a nutshell, with nobody trusted & respected to report world events accurately, the Administration is free to contradict facts bold-facedly and the public either buys the lies or is willing to entertain the notion.In a state where the "Fourth Estate" does not function, the truth is a casualty and becomes open to interpretation -- or spin -- or outright political manipulation.You can't have Democracy without an informed populace. Tom is right, this is unacceptable. His book is unusually forthright, startlingly direct, and surprisingly it names names.That it came to print at all is a glimmer of hope that a free press still has a chance to resurrect itself, and the tide may yet be turned. If you buy the role Fenton proposes for the media, then perhaps you might like this book more.But since he simply posits that the media is there to protect the country, promote unity, and a whole list of other (about 10 total) roles of the media, and then fails to explain why this is the media's role.....I sit there questioning this expansive role of news. I see the newsmedia as a source of information.They are to provide the people with the who/what/where/how and why of what is going on in the world at large and locally.They are NOT to be ideology machines, whether good or bad ideologies. Fenton observes how foreign news has drastically declined since the Cold War and how disastrous this has been.Here, describing the ins and outs of his field he excels, and does not spare any administration or political position.Yet he fails to notice that the reason why it was so much easier to report news in the Cold War era, and why his goals of unifying the country blah blah were so much more attainable is because we had an obvious enemy in front of us.In today's society, what foreign threat do we focus upon?Terrorism, the middle east, n. korea, chinese economic expansion, resurgent russian and japanese nationalism?Its unfortunate and a very valid point that the newsmedia seems to focus on NONE of these, at least with their own correspondents abroad.But Fenton's attacks often draw upon the sympathies of a post-911 world.Of course the news, like the government should have paid more attention to Bin Laden and company.We now that NOW.But hindsight is 20/20. Fenton's message is that entertainment trumps hard news every time.The causes of this include "underfunding, arrogant insularity, contempt for the view's attention span, loss of mission, corporate greed." 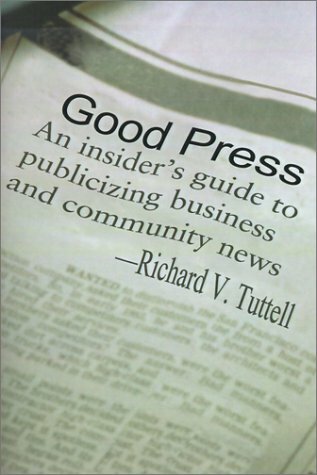 (p. 191)News media are now owned by corporations that own many other businesses.Profit, or the bottom line, is their mission, not informing the public.This has led them to close foreign news bureaus and to take their "news" from local feeders.At the same time, salaries for anchors and other stars of the news media have risen from $36,000 for each in the mid-1960s to 12 or 15 million apiece today. Fenton mentions blogs and ezines but contends that they are mainly pushing a point of view rather than reporting hard facts. As one solution, Fenton recommends the formation of a news pressure group, perhaps composed of retired newsmen and anchors.The group's first job should be to "out" news executives who turn down important news stories.The group "should run a weekly register of egregious news shortfalls." (p. 236)It should also feature "comparative lists of how the media in other countries reported stories differently from ours, or showed us up in reporting what we didn't." Perhaps we could add that a good place to get the news you're not getting is to read the many nonfiction books available here on Amazon.One of the most important recent books is While America Sleeps: How Islam, Immigration and Indoctrination are Destroying America from Within. Anyone who tries to follow news in the current atmosphere of world events knows that journalism, TV journalism in particular, is in a sad state.Retiring foreign correspondent Tom Fenton is canny to jump on the issue right now, when it's fresh in a lot of minds.He offers a lot of insights into what's wrong now.But in the end he lacks a clear vision of how the industry used to be and how it got to be where it is now. Fenton points out that the major American TV networks have exactly one foreign bureau these days, in London.At home, "news" often consists of repackaging press releases from the government or Big Business, and abroad, news is regularly purchased wholesale from the BBC and other sources, international bureaus have withered to a few stringers, and many networks (Fox News in particular) have fallen prey to creating "spectaculars" with celebrity newsmen like Geraldo Rivera. The author is correct to point out that this represents a major decline from the heyday of Edward R. Murrow and Walter Cronkite.News is on the skids.But as early as page twenty-seven, he reveals why things used to be better back in the Golden Age of newsgathering: the Cold War.Fear of the Soviets justified massive outlays that can't exist in the absence of a monolithic enemy.Any Noam Chomsky acolyte would point out that this means the news was NEVER really about facts, but rather about nationalist propaganda. And Fenton is contradictory about how things stand today.For instance, he suggests that many news veterans are still stuck in a Vietnam-era liberal mindset and that's why they're eager to let slide on hard news gathering, tossing softballs to world leaders like President Bush and Vladimir Putin.Let me repeat that for you: he thinks that it is old-line leftism that is causing the news to give a free pass to right-wing nationalists like Bush and Putin.Need I explain why this is a ridiculous notion? Still, there are a lot of ways Fenton is correct.Because newsgathering is toothless today, we have no context to understand forces like Islamist terror and Russian neocolonialism.Frivolous attitudes toward Chinese industrial expansionism and Venezuelan saber-rattling leave the average American unequipped to prepare for what may be our next big national struggle.And our highly overpaid news anchors have a moral responsibility to push their correspondents and stringers for a higher standard of reportage. Even the solutions Fenton suggests are valid.An hour-long prime-time news show every night would be a good idea, and the success of shows like Dateline and 60 Minutes proves that people would watch them.An FCC willing to enforce the networks' responsibility to the public good would bring news in line with what it should be, and what we certainly need, to grasp our place in the world. Bill O'Neil is a legend to individual investors everywhere. The Wall Street maverick founded Investor's Business Daily, which created a new generation of investor by providing carefully researched investment rules for targeting emerging growth, buying at the right time, and applying sell rules that ensure the greatest profit. Two decades later, IBD is a runaway success, and O'Neil continues to regularly beat the market at its own game. Do you want more investing opportunity? "Investor's Business Daily and the Making of MILLIONAIRES" is a book opening the golden door for better stock market investing.In his prized book, Mr. Saito-Chung focuses on the insider's secrets of Investor's Business Daily (IBD) newspaper.David explains all the powerful benefits of this financial newspaper concisely.He shows you all the effective investing tools available in IBD, helping you make better investing choices.Finally, David's book hits the target dead-center.On par with the best, its a top-notch guide for investor's who want improved opportunity. Mr. Saito-Chung's book was written to show IBD'S powerful benefits for better investing.He gives you a wealth of precious guidance in his book.David lucidly explains a cornucopia of powerful tools to use in IBD's newspaper for your investing benefit for bigger profits.IBD's financial tools are designed to strongly help you to improve your investing on Wall Street.David's book merit's your attention and is a quick-read, filled with high-caliber ideas for financial gain. Saito-Chung's book is NOT a 500 page, dry academic text on investing.Instead its a well written, 162 page, gold star book for you to make money.Its a friendly introduction to Investor's Business Daily (IBD) newspaper and is marvelous.With flying colors the book delivers many action plans, investment tools and top ideas.Because of this, I rate the premium book at least 4 Gold Stars, or higher.Check it out soon - you owe it to yourself. For those looking for a historical record of Investor's Business Dailey than this book is for you. Of course it doubles as a piece of marketing for IBD, but for true fans of the publication it shouldn't be bothersome. Its writen in a well documented and easy to read breazy fashion that makes it both a quick and enjoyable read. 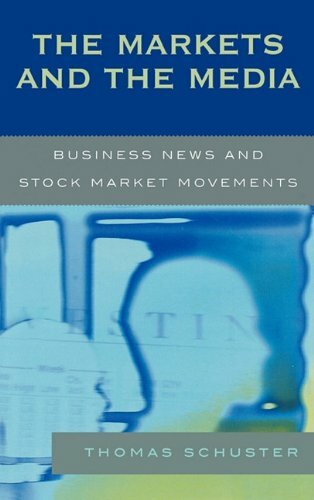 If you subscribe to IBD and would like to read some about the origin of the paper as well as cheerleading you to follow the CANSLIM system, then this is the book.You can get the same excitment from reading the readers success stories at the back of the book How to Make Money in Stocks. After reading this book myself I have to agree with the other reviewers. 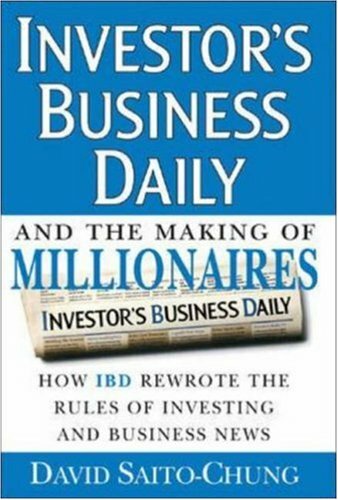 This book is very short on any advice on becoming a millionaire, it is simply a brief history on how William O'Neal got the idea for the IBD newspaper and started it. It was more of a labor of love for him than anything and it took almost 20 years to make the paper profitable. I am a huge fan of all things IBD and have made $1,000's of dollars following the CAN-SLIM method, so of course I had to buy this book. If your an IBD fanatic like I am buy the book, if not pass and pick up "How I made $2,000,000 in the stock market by Nicholas Darvas, it will probably be more of what you are looking for. (Also it is William O'Neal approved). 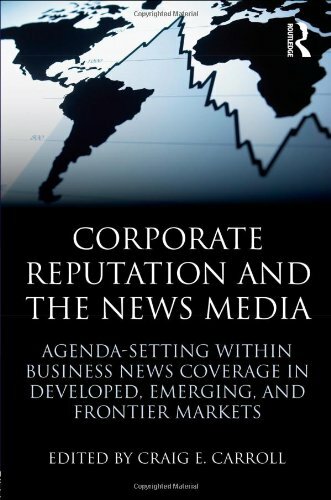 This volume examines agenda-setting theory as it applies to the news media’s influence on corporate reputation. It presents interdisciplinary, international, and empirical investigations examining the relationship between corporate reputation and the news media throughout the world. Providing coverage of more than twenty-five countries, contributors write about their local media and business communities, representing developed, emerging, and frontier markets – including Argentina, Brazil, Chile, China, Germany, Greece, Japan, Nigeria, Spain, and Turkey, among others. The chapters present primary and secondary research on various geo-political issues, the nature of the news media, the practice of public relations, and the role of public relations agencies in each of the various countries. how media coverage of specific public issues and news topics relates to the associations people form of specific firms. Contributors contextualize their findings in light of the geopolitical environment of their home countries, the nature of their media systems, and the relationship between business and the news media within their countries’ borders. 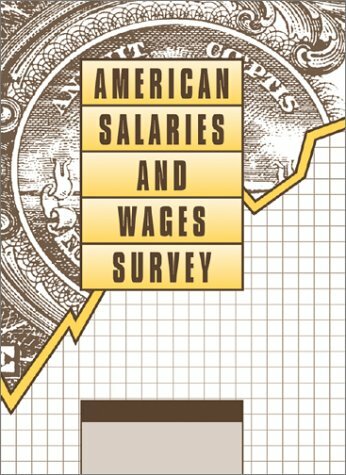 Incorporating scholarship from a broad range of disciplines, including advertising, strategic management, business, political communication, and sociology, this volume has much to offer scholars and students examining business and the news media. While talking heads debate the media’s alleged conservative or liberal bias, award-winning journalist Bonnie Anderson knows that the problem with television news isn’t about the Left versus the Right-- it’s all about the money. From illegal hiring practices to ethnocentric coverage to political cheerleading, News Flash exposes how American broadcast conglomerates’ pursuit of the almighty dollar consistently trumps the need for fair and objective reporting. Along the way to the bottomline, the proud tradition of American television journalism has given way to an entertainment-driven industry that’s losing credibility and viewers by the day. Chomsky was right, and Anderson has the proof. infotainment age reaches its belligerent maturity. This is the definite cluetrain (doc searls et al)for broadcasTV news. Much the same way cluetrain sparked a marketing revolution, this does the same for broadcast journalism. I first meet the author when she was interning for Florida Today in Cocca Beach. Every point she makes in this book is vaild. The take on "fox fair and balanced" tells me she won't be on the O'Reilly factor anytime soon. I found only one sort of error.FYI> Matt Lauer does have a broadcast journalism background on the local level. He came out of the same environment that former NBC correspondent and current talk show host (WBUR Boston) Robin Young did, PM Magazine at WJAR TV 10 in Providence Rhode Island.That's the only small flaw I could find in the book. The suits at CNN don't want you to read the book. They are not happy campers and with good reason. The hollywood suits trashed the network big time, and with than came the opening for Fox news to fill.Rick Kaplan is currently doing the same thing for MSNBC that he did for CNN take it down the pike. It's a fast read but once you start you wont' want to stop. News Flash appears as a rising meteor against a field of weakening stars. Ms. Anderson's book takes the reader through the shenanigans of the TV news broadcasters in their unadulterated striving for place and profits while leaving behind journalistic investigation and integrity. Her words turn out to be an exciting journey of personal experience and incisive exposure. As a long time news journalist Ms. Anderson sets a fair bar for news organization to reach. Her experiences and reporting often show just how good news organization can function. The same intimacy exposes the petty, inexcusable machinations of networks in journalistic decline. Ms. Anderson's news flashes exposes the perfidy of CNN's executive wing in its Tailwind scandal, the staging of news as presented by NBC's Dateline story on General Motors in 1992 and the apparent homophobia of Roger Mudd givenhis attitude toward AIDS victims. But indeed, Ms Anderson is not a muckraker. On the contrary, hers is to excite the industry to better, to reset the standard of TV journalism. She gives as examples her own series on drought and famine in Africa bringing a change in American policy on humanitarian aid, or of CNN's initiative in covering the return of twenty-four U.S. Navy spy plane crewmen held in China. While these could be considered scoops, her admiration for her industry is best held by her words on the, "spectacular breaking news coverage of the 9/11 attacks." Ms. Anderson words border on the requirement for broadcast journalism to return to its traditional values and to assure the public a clear and unbiased presentation of the news. Ms. Anderson carries the fight to those in the industry already sullying news broadcasts as entertainment and who have diluted their own professionalism for money, position, or simply hubris. Bonnie Anderson's book has brought to the light of day what I have felt has been a problem with the media for some time. Many of the newscasts are more concerned with form, not substance; how they look and not what they say. Her book is a very good read and pulls no punches in pointing out the way many in the media are more concerned with entertainment than hard news coverage. Her description of this type of coverage as "Infotainment" is right on point. News Flash brings to the reader another big problem influencing news coverage which is how mega mergers are affecting the coverage that is being presented to the viewing public. Unfortunately the impact is not good and these large conglomerates are proving the old adage "bigger is not always better" to be very true. 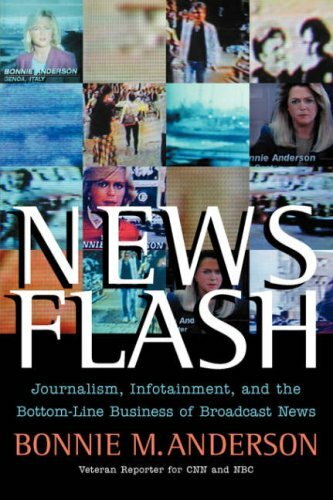 From her experience at CNN as a reporter, managing director of a news division and Vice President of Recruitment and Training, Anderson offers the reader a unique perspective as to what goes on inside a large news organization. She provides an in depth look at what takes place behind closed doors when it comes to hiring, firing and staffing in today's media corporations and much of what she reveals should be quite disturbing to the viewing public. This book provides some very interesting statistics about the media and its management which I am sure most of us were never aware of. While Anderson points out numerous things that are wrong with today's TV media and its management, she also brings out the good that the true journalist can and should do. At the end of the book she offers her thoughts on what the media can do to provide the viewing public with quality news coverage. She should be commended for taking a stand and bringing to our attention the problems and proposing solutions to get TV journalism back to the quality we need and deserve. In light of Anderson's criticism of the TV networks and cable news channels, it will be interesting to see if any of the media will afford her the same opportunity to present her views as they did when Bernard Goldberg published his book on bias in the media. If they do not, shame on the media, again. This digital document is an article from Pipeline & Gas Journal, published by Oildom Publishing Company of Texas, Inc. on March 1, 2009. The length of the article is 980 words. The page length shown above is based on a typical 300-word page. The article is delivered in HTML format and is available immediately after purchase. You can view it with any web browser. 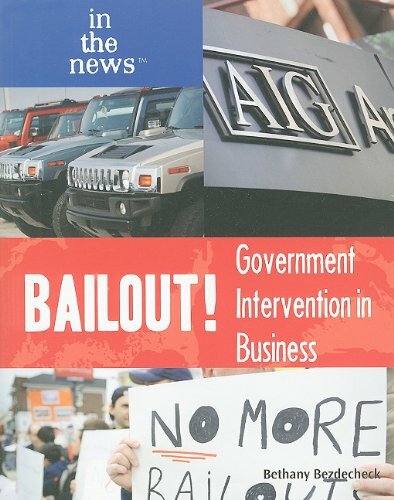 Publisher: Oildom Publishing Company of Texas, Inc. This digital document is an article from Underground Construction, published by Oildom Publishing Company of Texas, Inc. on December 1, 2009. The length of the article is 341 words. The page length shown above is based on a typical 300-word page. The article is delivered in HTML format and is available immediately after purchase. You can view it with any web browser.